This is a guest post by Nuno Guerreiro, Senior Associate, HOK. History tell us it takes nearly 50 years for a game to be recognized as a professional sport. As Atari’s Pong, the groundbreaking arcade game of the 1970s, approaches its 50th anniversary and esports captivates sports fans worldwide, this adage also is proving true for non-traditional competitive sports. In 2017 revenue from esports exceeded $655 million, and this number is expected to touch nearly $900 million in 2018. As esports expand, venues are starting to explore what their purpose-built venues will look like and how they can attract this next-generation of fans while satisfying the distinct needs of competitors. Because most traditional sports are played in similar ways, strategies for innovative venue design have tended to focus on the needs of fans and sponsors. But esports require a completely different mindset. Traditional bowl design methodologies simply don’t support an esports event. With so many different types of competitions, a layout that works for one game might require radical transformation for another. Team games like Counter Strike, for example, require players to watch individual screens, while player-versus-player matches like Street Fighter require competitors to share a setup. Given these unique, ever-changing requirements of esports events, we believe there will be a move toward more circular, scalable venues that can be sectioned off and configured to accommodate the specific needs of each individual game. To ensure the venue can cater to any esports event, we envisage a player infrastructure that can be easily added, removed or shifted around the arena as needed. To generate excitement and foster team loyalty, these player components could even be positioned among spectator seats. Esports venue design requires considerably more digital inventory than traditional sports. This inventory in an esport-specific venue could include personal screens, feeds that display player statistics across signage throughout the arena, lighting and in-venue effects that enhance the fan experience and infrastructure required to live stream events for global spectators. 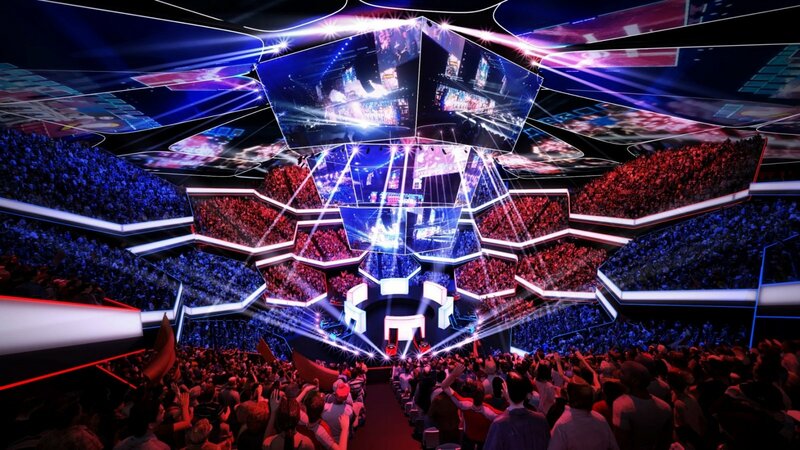 As one potential solution to the vast technology needs of an esports event, HOK has designed large, movable, petal-shaped screens that can be used for lighting and effects as well as content displays. These enormous surfaces hang above the seating bowl, doubling as ‘team screens’ and giving spectators a feeling of being in the centre of the action. Esports communities are built and fostered online, with events offering opportunities for members to meet and engage in person. Concourses and plazas should be flexible to host community activities in addition to facilitating a memorable event experience. To cater to the fan base, HOK has explored altering the layout of the main event space to incorporate a mix of seating and safe-standing lounge areas. This enables spectators to enjoy a variety of activities around the venue without missing the headline event. As industry requirements and technology advance with the rapid growth of esports, venue renovations and purpose-built facilities need to keep pace. Existing stadiums attempting to cater to esports will need to experiment and innovate to compete with purpose-built venues already emerging around the world.